I could not find this else where and hence, I decided to build one myself – a complete list of PeopleSoft tables. Often a times when working on something like a PeopleSoft issue or a PeopleSoft upgrade, you feel the need to have a handly list of PeopleSoft tables. What we’ve tried here is to provide a huge list of PeopleSoft Tables so that when you want to have quick access to PeopleSoft Tools Tables and their usage, then you can simply head over to this post. PSRECDEFN This table holds the information of all the peoplesoft records. PS_DATA_FIND_BASE Used as search record for the panel. SHould always be empty. PSOPRDEFN This table holds the peoplesoft Oprid’s/passwords info with symbolic id. PSLANGUAGES Contains 1 for the column INSTALLED against the columnLANGUAGE_CD. 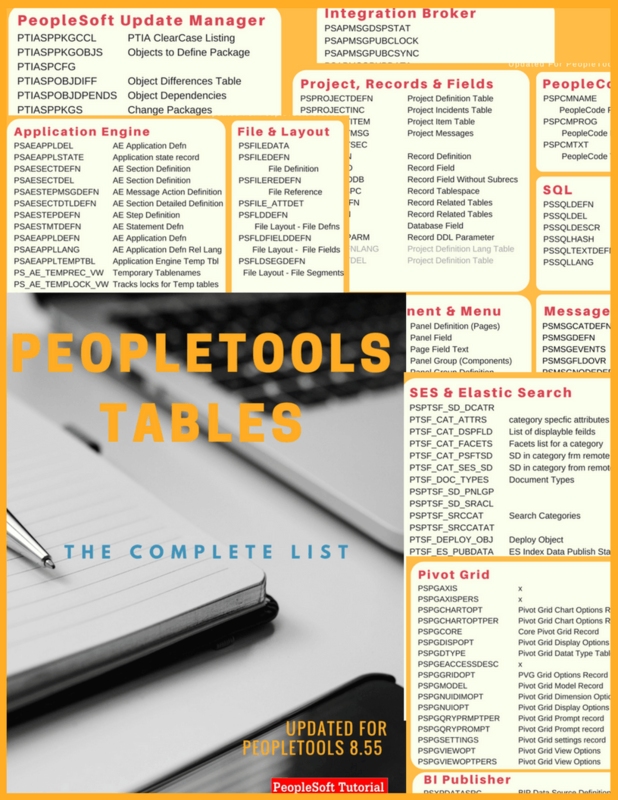 Though we tried to compile a comprehensive list of all PeopleSoft tools tables but we may have missed some of those. If you know of any other important tables which are not present in above list, please do share with us in comment section below. Never Again Google for PeopleSoft Tables.